Last year, the company closed a Series B round of funding led by strategic investors Boeing HorizonX and GE Ventures, who also participated in this latest round, along with New Enterprise Associates (NEA) and others. Upskill has attracted its investments based on the strength of its Skylight AR platform, a productivity suite that displays guided workflows via smartglasses, facilitates remote collaboration, and enables experts to easily author content. The company also acquired Pristine, a complementary AR platform, last year. "We saw substantial growth in the last year further amplified by the launch of our new product release. That acceleration is what led our investors to participate in this new funding round," said Brian Ballard, co-founder and CEO of Upskill, in a statement. "Upskill's group of investors now include leaders from all parts of the industrial augmented reality ecosystem, which is an important signal in the market and speaks to how we collectively contribute to digital transformation." In addition to its investment, Accenture has struck an alliance with Upskill, with the former integrating the latter's Skylight software into its Accenture Digital Distribution Solution, a platform that enables enterprises to push any type of content to any device in its fleet. "Upskill's Skylight platform provides a critical piece in delivering on the promise of extended reality in the enterprise, dramatically improving productivity and performance while increasing safety, and helping to reduce the distance between workers and subject matter expertise in a highly effective manner," said Paul Daugherty, chief technology & innovation officer at Accenture. While the industry awaits a true winner in the race for consumer-centric smartglasses, companies that cater to enterprise users are already finding success with practical products and services. And enterprise AR users, as they see how the technology can have a positive impact on their businesses, are increasingly willing to sign checks as customers and as strategic investors. "Wearables are emerging as a new category of 'things' enabling real-time worker connectivity and collaboration in industrial environments. Adoption of AR-enabled smart glasses, in particular, has reached an inflection point," said Rob Salvagno, head of corporate development for Cisco's investment arm. 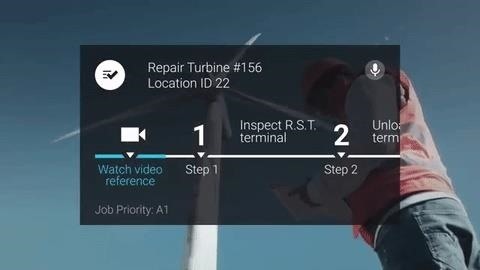 "Upskill has a strong track record of delivering worker productivity, efficiency and safety-based ROI for its customers through its AR platform. Cisco's investment in Upskill aligns well with our deep commitment to IoT and digital transformation of businesses."